Do you have ancestry in the Logan City area? Mt Cotton, originally settled by German pioneering families, is in the Logan City area, Queensland, south of Brisbane. Mt Cotton (Cornubia) Cemetery is located at the corner of Mt Cotton and Wuduru Roads, Cornubia. The earliest known burial is that of Detlef Holtorf, who had been born at Rostorf in 1846 and died at Mt Cotton in 1881. More recently, a columbarium has been erected at Mt Cotton Lutheran (St Paul's). A plaque on the church commemorates the settlers who arrived in the early 1870s and the erection of the first St Paul's Lutheran Church in 1875. 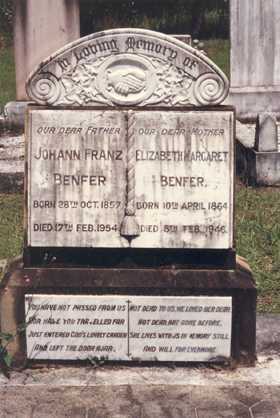 The earliest plaque records the death of Edward Albert Benfer who died in 1932 aged 1 day. These transcripts were made in December 1995. They're a terrific genealogy tool for anyone exploring their family history or building their family tree.